The spring sessions were a big hit, filled with practical information and interesting discussion. It’s always a delight when students report in week two that they’ve successfully implemented material covered in week one. 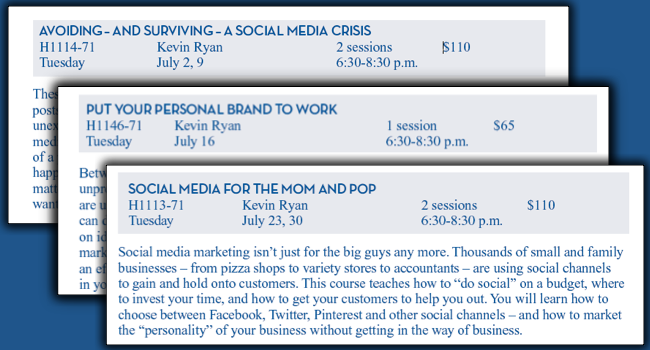 Surviving a Social Media Crisis, a four-hour class on dealing with the things that can go wrong in social media, from consumer complaints to errant posts. We offer practical advice on overcoming challenges – and avoiding them in the first place. July 2 and 9. Putting Your Digital Brand to Work, a two-hour class that examines how professionals can use social media tools to capture attention, enhance their reputations and increase opportunities. It’s good for professionals looking for work, and those to advance. July 16. Social Media for Small Business, a four-hour course on the essentials of social media marketing for small businesses. We look at how to “do social” on a budget, where to invest your time and how to get your customers to help you out. July 23 and 30.